We are occasionally asked how it’s possible to make a list of favorite tracks, and then find that list on a different computer. You may be browsing music from home and wish to make a list of bookmarked tracks that you would like to come back to when you’re in your office, to actually make the purchase from there. As you may have noticed, our site does not have “user accounts” and does not require that you set up an account, or log into an account, before making a purchase. We have considered this several times, but we feel that a lot of customers like that about our site – that they can just come, browse, place an order. All without having to create a user account first. However, not having any user accounts, we have no way of tracking a person from their home computer to their work computer. But there is still a way that you can create a list of favorite tracks from home, and then access that list from your work computer, by using Mozilla Firefox web browser. The Firefox browser has a feature called “Firefox Sync” which lets you create a Sync Account with Firefox, and all your bookmarks, log in information, saved passwords, etc. will be stored within that account. 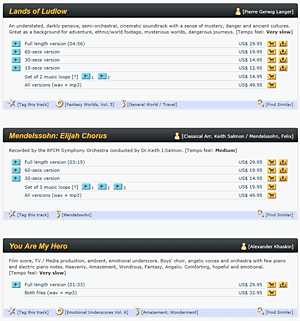 So you can have all your bookmarks and other such information shared between your computers. I’m using that feature myself and it’s really great. If I bookmark a page on my office PC, I can see that bookmark on my laptop when I’m traveling. 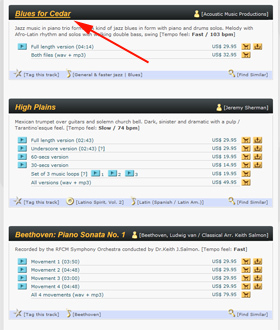 If you want to bookmark a specific music track, simply click on the track title. That will take you to a page that specifically displays only that one track. 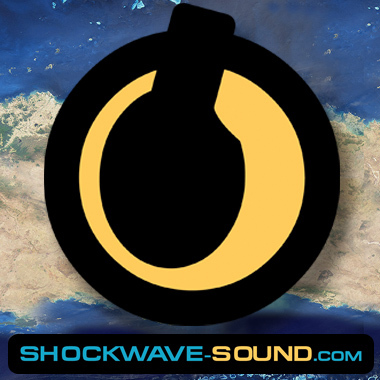 The URL for that page looks something like: www.shockwave-sound.com/track/xxxx (where the x’es represent the track ID number in our catalog). While viewing this page, you can Bookmark the page and easily find this track later. And if you’re using Firefox Sync feature, you can see that bookmark on all your synced computers. So when you start up Firefox on your work computer, you’ll see the track bookmarked there.